Our second review of the month is another Super Nintendo classic. This time we're taking a look at Mega Man X3. 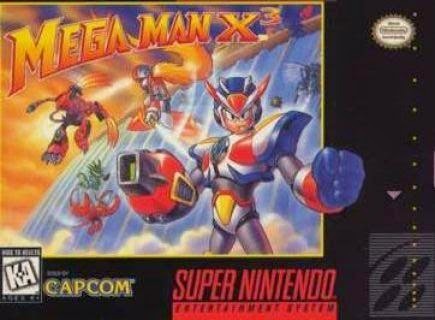 A PlayStation version later came out, and it was the version used in the Mega Man X Collection compilation from the sixth generation of game consoles. Regardless, if you're looking for a cool Mega Man-related review, X(3) marks the spot. Mech-a no mistake-- Mega Man X3 is one awesome ride! 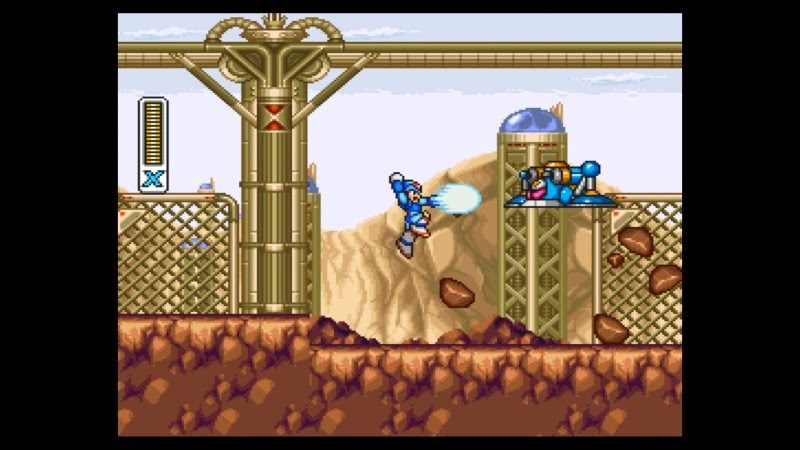 For the first time ever, Nintendo's classic digital games library known as the Virtual Console has Mega Man X3 available on it. It's of importance to note that this is solely the Wii U Virtual Console being referred to. 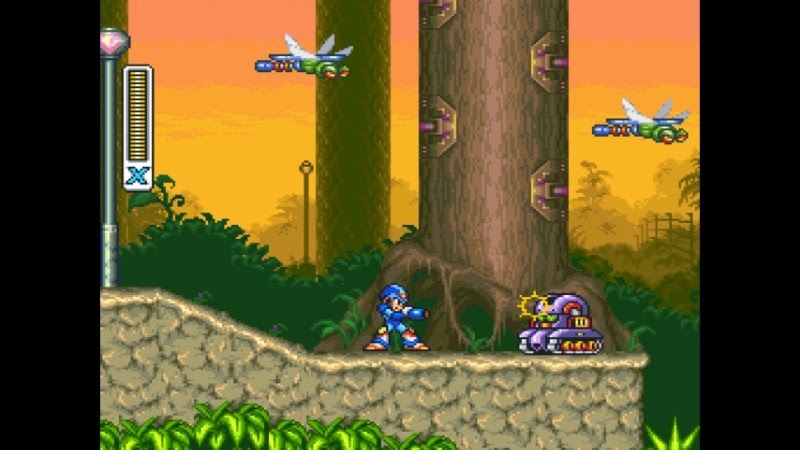 Regardless, if you've been waiting to finally play the Super Nintendo version of Mega Man X3 and do so in a legal manner that didn't require paying at minimum $100 for a used copy, then this Virtual Console release is the right one for you. 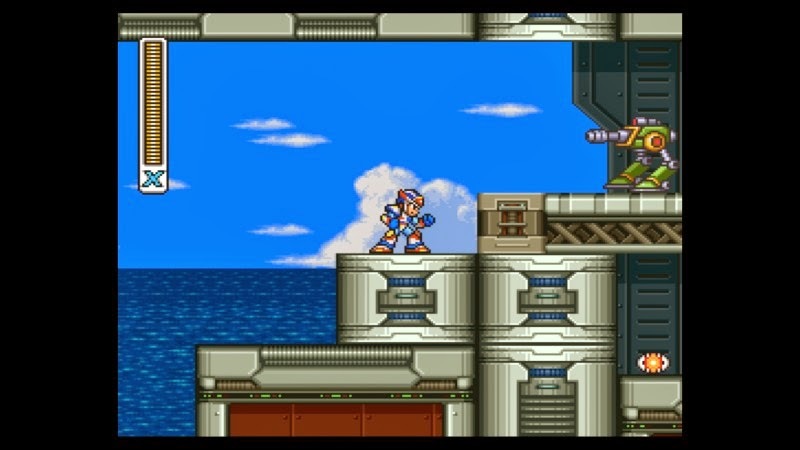 It doesn't hurt that Mega Man X3 is a damn good 2D action game. It is a futuristic age intelligent robots known as Reploids coexist with humans. At least, that is the wish of their creator, Dr. Cain. When a Reploid's free will causes it to become chaotic and unfriendly, it is known as becoming a "Maverick." Dr. Doppler is famous for coming up with the technology to neutralize Mavericks and turn them back to their calm selves. 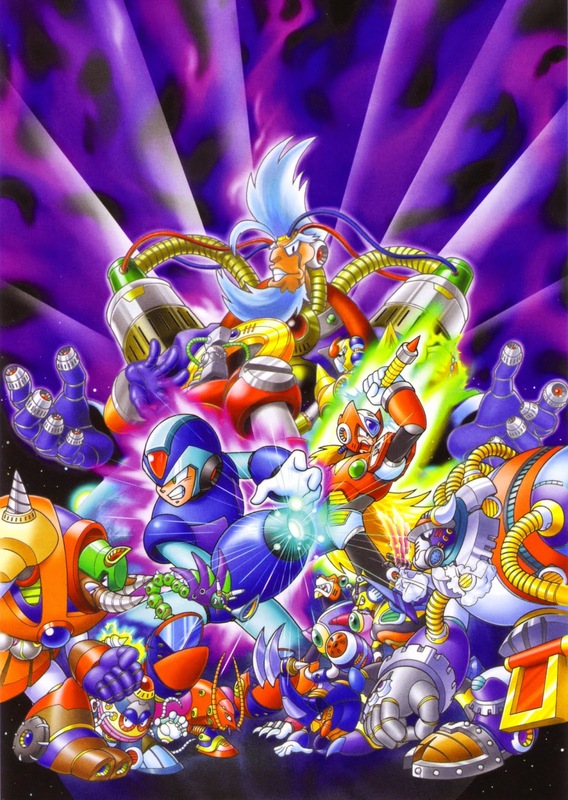 The reformed Reploids created a utopia of sorts known as Doppler Town. However, they returned to their Maverick state, growing violent, and even attacking the Hunter base where X, Zero, and Dr. Cain reside. The blame is put on Dr. Doppler, so X and Zero head out to hold Doppler accountable. rock going on here in Tunnel Rhino's stage. If you've played at least one classic Mega Man game or the any Mega Man X title out there, you're familiar with how the structure of the game works. You're eventually let loose to choose from one of eight levels. These can be played in any order. Each level ends with a battle against a boss. A defeated boss will grant X with their special weapon. This special weapon can be used on a certain other Maverick boss to make the battle much easier. Finding out which boss is weak to which special weapon is a challenge on its own. There's trial and error involved with this route, but that is the way of these old school Mega Man games. For the first time in series history, players can switch to Zero. However, this is incredibly limited, specifically as if Zero loses all of his health or absentmindedly falls into a pit or row of spikes, he can no longer be utilized. This lasts for the entire play-through, too. It wouldn't be until subsequent sequels that Zero would be a full-time character to play as. Mega Man X3 has plenty of replay value, moreso than the two games that preceded it. Of course, there's still eight heart tanks that extend X's life gauge and four sub-tanks which act as a reserve of health if X's life gets too low. Nonetheless, Mega Man X3 brings even more optional content to partake in. Take to Mavericks in all sorts of places. It's a jungle out there, after all! For instance, X can go about collecting four different robot armors within the game. At specific call-in points in various levels, X can pilot one of the four mechs. One is your typical offensive armor with nothing really else that makes it special, while the Frog armor is terrific in water, not so much on land. Mechwarrior has nothing on Mega Man X. Fans of the Mega Man X series know that X can get armor upgrades through finding Dr. Light's hidden capsules that were stowed away in secret locations, just waiting for X to find them. This piece of Mega Man X tradition continues, offering upgrades to X's helmet, arms, legs, and body. However, there's also for the first and only time in the series, red capsules, of which there are four in the game. Unlike the traditional blue capsules, players must decide with of the four upgraded abilities they want. Once they get one of these special abilities, all of the other red capsules are rendered useless and put offline. If you ever wanted to dash twice in midair, there's an app-- er-- capsule for that. X's appearance changes as well. 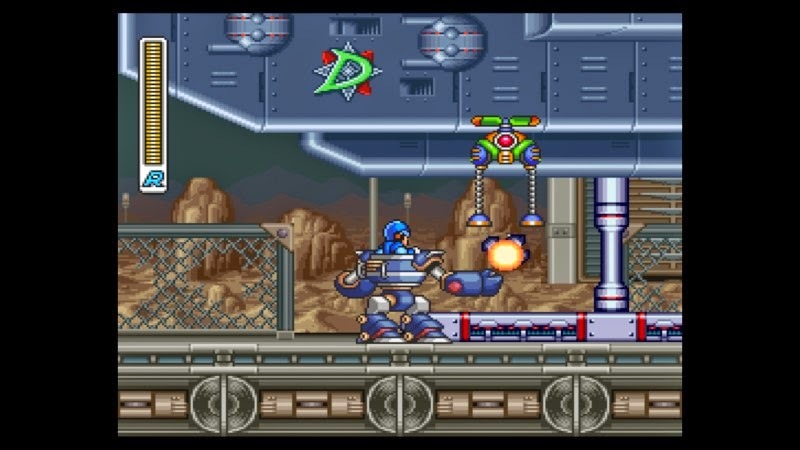 Mega Man X3 also changes up the final stages on players depending on whether new antagonists Bit and Byte were defeated or not when X came across them in two of the eight Robot Master levels. If they were, then their boss fight where they combine into one mechanical creation is replaced by another boss. The same goes with Vile. He won't be the final challenge of the second Dr. Doppler stage if players enter his lair, defeat him with a particular special weapon, and successfully flee from the area before it explodes. Instead, a new boss will take his place. Despite the added replay value of Mega Man X3, you are still going to deal with a rather short yet sweet game. A first run through the game might last no more than three hours. Now, that would definitely be a bum deal if it weren't for how fun it is to replay X3. It just isn't X3 that is engaging to go through time and again; it's generally how the Mega Man series works in general. Like a shotgun blast to the face! 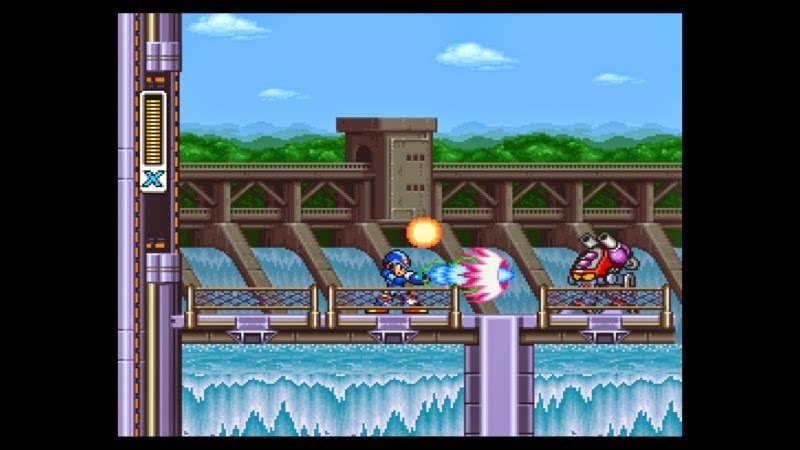 Mega Man X3 sports incredibly clean and detailed spritework and backgrounds. It can be way too easy to speed through levels, missing the details, so sometimes just stopping to proverbially smell the roses is awesome to do. That way the backgrounds and their many pieces of eye candy can be better appreciated. The music of Mega Man X3 is indeed catchy, focusing more on rock than anything else. It is, however, decidedly weaker than its two predecessors. 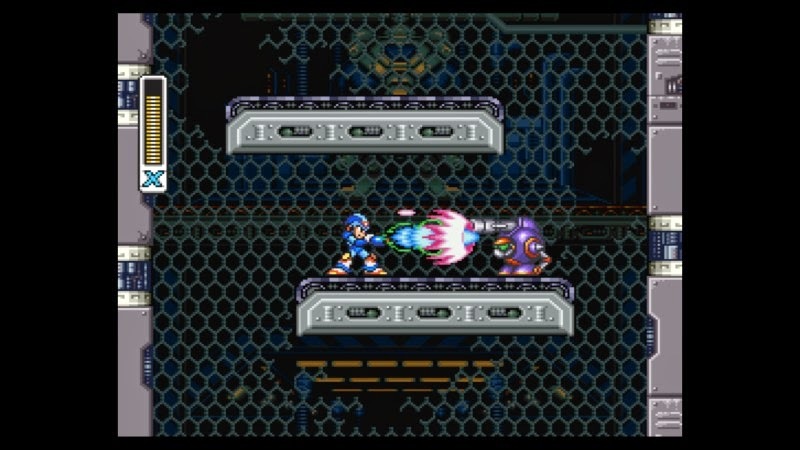 Overall, Mega Man X3 delivers plenty of excellent twitch-based action-platforming and intense battles. Sure, way too many of the bosses rely on running into walls, but it doesn't adversely affect the Maverick encounters too badly. 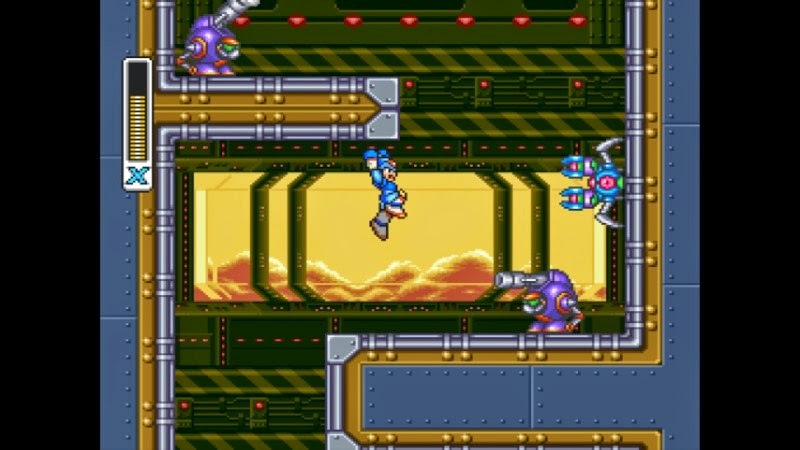 The amount of replay value exceeds that of Mega Man X and X2, allowing multiple runs through the game to be as different as the player prefers. The addition of a playable Zero is nice, but his inclusion is far too limited to be 100% excited about. Regardless, Mega Man X3 is a successful 2D action game, and it's a wonderful ending to the Super Nintendo trilogy of X games. Important Update Regarding SuperPhillip Central from Yours Truly! Hey everybody. I've come to a decision about SuperPhillip Central that has made me very relieved and satisfied. No, there's no bad news like me quitting the site or anything like that. (Hopefully you would consider that bad news and not good news!) No, instead it's a change of approach to better suit my life and what's going on with me. I am back at college this semester, and I'm really wanting to have another great semester as well as focus on what I'd like to do for a career, game design. If you've been following me on Twitter and have caught some of my tweets, I've been talking about my first major game project I've been working on called Super Push Adventure. This is very exciting for me, as it will be my first published game ANYWHERE! I'm also doing a lot more things within the community. I'm being an exhibitor at a local game development festival and showing off my game in action. I attend regular developer meetups, demonstrations, and presentations. I'm also regularly having outings with friends. These are things I didn't really do or make time for in the past. That's not the entire reason I wish to cut back on posts at SuperPhillip Central. I've been doing this site pretty much by myself for over six years now. I've really enjoyed my time, and by no means am I anywhere near finished. However, it's gotten to a point where I feel bad about missing a daily post or being late with an article or review. I'm treating SuperPhillip Central like a job, with deadlines and everything, and it's unneeded pressure. That and it makes writing turn into a chore instead of something I can enjoy 100% of the time. What does this mean? It's simply that I'm not going to be constrained by forcing myself to post every weekday if I'm unable to, and simultaneously not feel guilt (however minor it might be) about not getting an article finished "on time." You will still get to read my thoughts on the industry, see fun little top ten and top five lists that I love writing, see editorials, view reviews, and so forth. It's just that they'll be more spontaneous rather than "okay, today is Tuesday, so that means THIS article must be posted by such-and-such time." I will still post SuperPhillip Central's Favorite VGMs on Mondays (or cheat and post them on a Wednesday yet still have the published article read Monday, hehe). On a side note, with all that is going on with "GamerGate" and gamers and the press being increasingly more vitriolic towards each other, their hobby, and this industry, I've sort of lost interest in posting articles to feed that negative mentality. Goodness knows I've done that enough in the past! I'm going to write positive pieces that celebrate gaming, or articles that don't slam gamers or the press such as "Bad Levels in Gaming History." These are articles I can enjoy writing without feeling any anger or frustration doing. That said, I'd love to hear... er... read what you'd like to see more of or less of on SuperPhillip Central. I know I don't get tons of comments, and that's sometimes a good thing because some days I just don't care to argue! Ha-ha-ha. However, right now I'd love your input on what you think about the direction this site is taking. If you keep on reading, I'll keep on writing!